Luxury is a hard-to-define concept these days. Every product and experience seems to be touted as the ultimate luxury, so it comes as a surprise to have a real luxurious dining experience in Hong Kong these days. 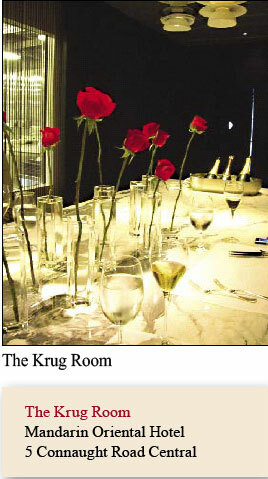 The Krug Room at the Mandarin Oriental Hotel is an exclusive dining experience, with a price tag to match. 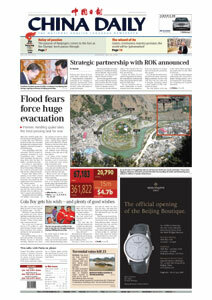 The prestigious Champagne House of Krug has four exclusive Krug Rooms in the world, one in the basement of the legendary Dorchester Hotel in London, another beneath the Tokyo restaurant Tanga, one at the Switzerland Hotel Lausanne Palace and Spa hotel, in a private terraced space overlooking Lake Geneva, and one in Hong Kong at the Mandarin Oriental Hotel. It will be highly unlikely that any hotel guests will chance across this exclusive and mysterious Krug Room. Hidden deep within the bowels of the hotel's inner corridors, one reaches this top secret location through an inconspicuous side door inside the Chinnery dining room. You walk through staff corridors lined with dark walls and 1920's posters and enter into a long and well designed space - the Krug Room. Designed by Hong Kong designers Marc and Chantal, the Krug Room features a long table covered with single red roses in individual vases, a floor to ceiling glass window along the side of the room, providing a glimpse into the secret workings inside the kitchens of this five-star hotel, as well as a slate wall, on which the menu of the day is written on with chalk. The specially designed chandelier, created as a collage of white bowls and plates runs along the length of the table, reflecting the soon-to-be partaken meal below. Elements of the Krug cellars in Reims are incorporated into the room, with floors made from the same oak as the traditional barrels Krug champagnes are still fermented in, chalk for the slate wall similar to that of the chalk deposits from which the Krug cellars in Reims are carved out from, as well as custom-designed chairs made to resemble the shadows cast by a full wine glass. Once seated, guests will be presented with an engaging explanation of what they can expect to look forward to that evening, and the Krug vintages on offer that evening, such as the phenomenal Krug Vintage 96. Paired with the champagnes, on the evening of our visit, was a 10 course tasting menu, prepared by Uwe Opencensky, executive chef of the Mandarin Oriental. Ever since his appointment to the Mandarin last year, Uwe Opencensky has breathed new life into the Mandarin Grill with his innovative and experimental cooking. Having trained for six months at the legendary temple of molecular cuisine, El Bulli, under Ferran Adria, as well as cooking at renowned establishments ranging from Toast and Mosimann in London, and with Alain Ducasse in Paris, one can expect a dinner worth looking forward to at the Krug Room. The meal starts off on a "hard note", as a plate of seemingly hard pebbles are placed before the guests. The illusion pays off and only after a quick debriefing, confounded guests are able to distinguish the two baked potatoes in the center of the plate, baked with an edible clay outer shell, with aioli on the side for a quick dip in. The next dish, a golden caviar, is another dish of illusion, with caviar-like droplets, created with gold, lychee and passionfruit. The fun continues with dish after dish of fantastical creations, the Mummy spring roll, the cuttlefish "noodle" and the "breakfast" egg dessert, which is in fact a mango "yolk" swimming among a sea of coconut cream. And if you think by the end of the meal, the Chef would be hard pressed to come up with even more out-of-this-world illusions, then the final offering - the petit fours, arrives as a make-up compact, filled with watermelon powder "blush", complete with cotton candy "make up puff", and ends the evening on a high. The Krug Room is an experience to challenge the senses. One may argue that such experimental dishes may be more pleasing to the intellect then to the taste buds, but if one has to experience the new direction culinary experiences are taking, the Krug Room is your best bet. To top it off, impeccable service, and simply the chance to catch a glimpse into the surprisingly calm aura within the kitchens of this renowned hotel, is most certainly luxury at its best.